Desc: Black Hills Gold Sterling Silver cat with swinging tail necklace. The Sterling Silver chain is rope link and has a spring ring clasp. The pendant is fashioned to resemble a seated cat wearing a collar. One green gold and one rose gold leaf is mounted on the hips of the cat. The tail is hinged and swings freely when worn. 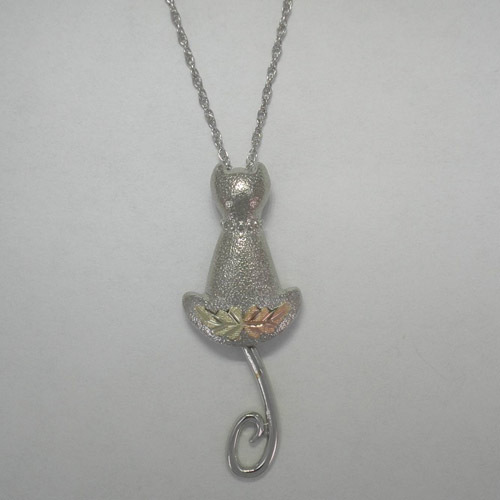 The cat has a textured finish and the necklace has a bright polish finish. The necklace is made in the United States of America.